This is the companies first Google Certified TV range. The TV will be available in 49-inch and 55-inch screen sizes priced at Rs 51,990 and Rs 61,990, respectively. Micromax has launched the company’s first Google certified Android TVs. The TVs will be available in 49-inch screen sizes and 55-inch screen sizes priced at Rs 51,990 and Rs 61,990, respectively. Both the TVs boast of 4K resolution with HDR 10 support. 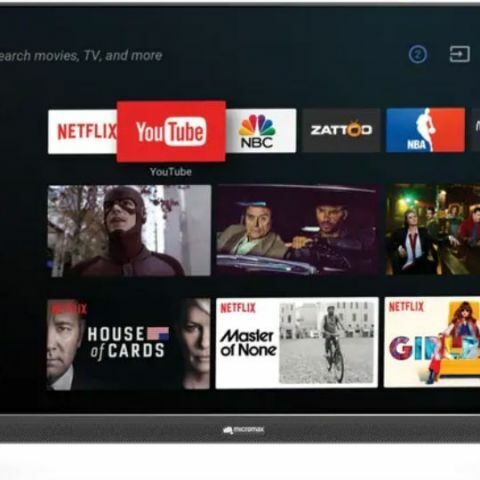 Google Certified Android TV means that the TVs will run on the Android TV platform and not AOSP (Android Open Source Platform). The TVs run on Android Oreo and boast of support for Dolby and DTS sound. Under the hood, the TVs are powered by a quad-core Cortex-A53 processor coupled with 2.5GB DDR3 RAM and 16GB EMMC storage. Thanks to the Android TV platform, the Micromax TVs boast of built-in Chromecast. They also support MHL, Google Assistant voice controls with voice-enabled search along with Wi-Fi and Bluetooth connectivity. For audio, the TVs have 2x12W speakers. The TVs will be available in stores starting November. "Today, with the launch of our first ever Google-certified television, we have taken a step further in providing our consumers with memorable and stunning picture-quality experience and a wide array of options with Google's Play Store. The new range targets the consumers who want a larger than life experience and desire to access smart android content on a bigger, sharper, crystal clear screen. We are committed to grow this category further and consolidate our position in the television segment in India," said Rohan Agarwal, Director, Micromax Informatics. We have seen the launch of a number of budget 4K HDR TVs in the past. Xiaomi has a 55-inch 4K HDR TV available in the market and also has a 49-inch 1080p HDR TV available. Other brands like TCL, iFFALCON, Thomson and more have also launched their range of UHD and HDR TVs in the market.